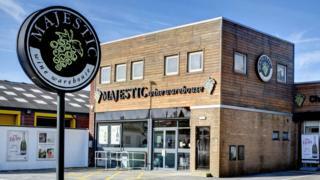 Majestic Wine has announced plans to revamp its business by closing some of its 200 stores and concentrating on its online Naked Wines division. More details of the store closures - and any job losses - will be given in June along with its full-year results. "Where we have no choice but to close stores we will aim to minimise job losses by migration into Naked." As a result of its planned increase in investment, Majestic said it would review its dividend in June this year. Shares in Majestic fell 8% at the start of trading. Analysts at Liberum called the move "a drastic and unexpected change in strategy". Majestic Wine is an enduring and well-loved brand and it is a real shame to think it is being replaced by Naked. It was a category-buster in its day - they took out-of-town sites, with parking, that weren't too expensive, and you were forced to buy wine in bulk, in multiples of 12, for licensing reasons. Another good thing about the business from a taste point of view was they used to buy wines directly from producers - a winery would make a wine and Majestic would buy it. In the past few years, under Rowan Gormley it has shifted, moving for the first time into selling wines under its own label. That's good for margin but has taken the shine off the brand. Mr Gormley clearly sees the future - and a better margin - with his own creation, Naked Wines. But while Naked does have some some interesting wines, it has some very ordinary ones too.